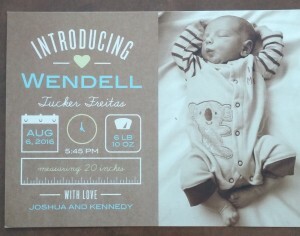 Today Amanda and I were blessed to meet lil’ baby Wendell Tucker Freitas! This little guy was born Aug 6th, 2016 at 5:45PM; weighing in at 6lbs 10oz and 20 inches long! Proud parents Joshua and Kennedy are so happy with his arrival. Momma is doing great and looking amazing. Huge thank you to Kennedy for personally bringing him by and blessing us with his arrival announcement card. We love meeting each baby we see in the womb. It is never too late to bring your precious baby in so we can give them some love! !